Born to be a Hero Bloggers Night! 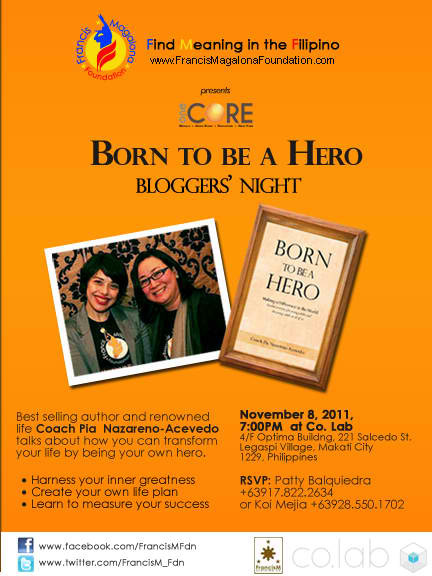 Gustong gusto ko talagang makaattend ng mga gantong events na you'll learn something from, kaya when I got an invitation from the OneCORE Team and the Francis Magalona Foundation on Born to be a Hero Bloggers Night, I said yes kaagad! Here's a pic of my new blogger friends PinoyGuyGuide.com's Chris, and lovely couple Ian and Yshy! "Co.lab serves as a hub to a collaborative community that share the same values of entrepreneurship, creativity, and integrity. This shared workspace is ideal for freelance professionals, home office workers, startup businesses, entrepreneurs, solopreneurs, and graduate." And dahil early birds kami nila Yshy and Ian, we got a Co.Lab gift card! :) Yehey! Ms. Patty Balquiedra, who invited us! :) Thank you! Ms. Pia talked about the vision and how the Francis Magalona Foundation started. I liked what she said about using music as their tool to reach even the younger generation in spreading nationalism and Pinoy Pride. Also, namention nya how they utilized blogging even way back na...naalala ko tuloy na reader ako ng blog ni Sir Kiko before! Super starstruck-mode ako when Maxene Magalona entered our small function room! Ganda lang! I love what she said about wanting her celebrity / popular status BUT using this to influence people positively. They handed to us our own BORN TO BE A HERO copies! Yehey! Coach Pia talked about different highlights of the book, and we participated in some of the activities. Can you identify your "raw feelings/rawness"... Are you comfortable with expressing your emotions and feelings even when people around you will get uncomfortable? We are born to make a difference in this world! There are a lot of valuable lessons from that night, especially for me na nagka-loko loko ang buhay early part of the year. Nung kinwento ko to sa friend kong si Geo kagabi...She said, "Pang kina-quarter life talaga ang target nyan!" Haha. One lesson that struck me is "to have the willingness to get down to the basics." There was a time that Coach Pia earned big sums of money that she will even have her hair shampooed sa salon. Pero minsan you have to have that sense of basic--so you will not lose control. Or else you become too high-maintenance, and this depletes the inner-self. Thank you also, Yshy, for being such a great company! Join the BORN TO BE A HERO seminar on November 26, and be inspired too! "You and I, we are meant to be great." aww Ms. ana, I love what you said about the 'sense of basic'. Kaya nakaktuwa talaga magbasa ng blog mo because may mga natutunan ako lagi sa mga post mo. :) Keep up the goodwork ana :) love love. hey Ana. Nice to meet you at the event! Hope to see you again soon. Pia Acevedo's the daughter-in-law of my patient :) I should as her for that book! Hahaha! Hi Ana! Thanks for coming! I'm glad the session was helpful for you! :D See you around!